An international group of astrophysicists has determined that a massive planet outside our Solar System is being distorted and destroyed by its host star – a finding that helps explain the unexpectedly large size of the planet, WASP-12b. It’s a discovery that not only explains what’s happening to WASP-12b; it also means scientists have a one-of-a-kind opportunity to observe how a planet enters this final stage of its life. “This is the first time that astronomers are witnessing the ongoing disruption and death march of a planet,” says UC Santa Cruz professor Douglas N.C. Lin. Lin is a co-author of the new study and the founding director of the Kavli Institute for Astronomy and Astrophysics (KIAA) at Peking University, which was deeply involved with the research. The findings were published in the February 25 issue of Nature. The research was led by Shu-lin Li of the National Astronomical Observatories of China. A graduate of KIAA, Li and a research team analyzed observational data on the planet to show how the gravity of its parent star is both inflating its size and spurring its rapid dissolution. WASP 12-b, discovered in 2008, is one of the most enigmatic of 400-plus planets that have been found outside our Solar System over the past 15 years. It orbits a star, in the constellation Auriga, roughly similar in mass to our Sun. Like most known extra-solar planets, it is large and gaseous, resembling Jupiter and Saturn in this respect. But unlike Jupiter, Saturn or most other extra-solar planets, it orbits its parent star at extremely close range – 75 times closer than the Earth is to the Sun, or just over 1 million miles. It is also larger than astrophysical models would predict. 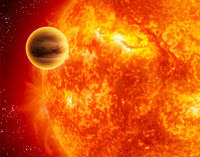 Its mass is estimated to be almost 50% larger than Jupiter’s and its 80% larger, giving it six times Jupiter’s volume. It is also unusually hot, with a daytime temperature of more than 2500°C. Some mechanism must be responsible for expanding this planet to such an unexpected size, say the researchers. They have focused their analysis on tidal forces, which they say are strong enough to produce the effects observed on WASP 12b. On Earth, tidal forces between the Earth and the Moon cause local sea levels rise and fall modestly twice a day. WASP-12b, however, is so close to its host star that the gravitational forces are enormous. The tremendous tidal forces acting on the planet completely change the shape of the planet into something similar to that of a rugby or American football. These tides not only distort the shape of WASP 12-b. By continuously deforming the planet, they also create friction in the its interior. The friction produces heat, which causes the planet to expand. “This is the first time that there is direct evidence that internal heating (or ‘tidal heating’) is responsible for puffing up the planet to its current size,” says Lin. The disk of planetary material and the embedded super-Earth are detectable with currently available telescope facilities. Their properties can be used to further constrain the history and fate of the mysterious planet WASP-12b.